Chronic kidney disease is a growing epidemic. In the last 10 years, the rate of chronic kidney disease has risen more than 25% in the United States. 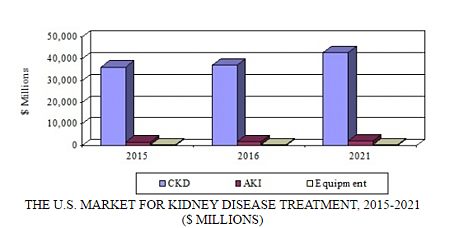 BCC Research reveals in a new study that predominant growth drivers of the kidney disease market include an aging population and an increasing awareness of both actue and chronic kidney disease. A critical health problem, chronic kidney disease can lead to end-stage kidney disease. Additionally, the risk of cardiovascular diseases and death increases with the progression of chronic kidney disease. There is currently no effective method to determine the prognosis of chronic kidney disease. Although usually only present in trace amounts in the body, recent technological advancements have enabled measurement of D-amino acids with much higher sensitivity. Levels of D-amino acids in patients can provide prognostic information about chronic kidney disease. Researchers from Osaka University have found that measuring D-amino acid levels in patients with chronic kidney disease can help doctors to identify those who are at high risk for progression to end-stage kidney disease. Their research findings were published in Scientific Reports. The group measured D-amino acid levels in the blood of patients with chronic kidney disease and followed their prognoses. Sixteen of 21 D-amino acids were detected in the blood of these patients. Further analyses revealed that D-serine and D-asparagine were associated with the progression of chronic kidney disease. Furthermore, the risk of progression to end-stage kidney disease was elevated two- to four-fold in patients with higher levels of these two types of D-amino acids. This method is also applicable to diseases such as cardiovascular disease, diabetes, and hypertension, the scientists said, because the prognoses of these diseases are strongly influenced by chronic kidney disease progression. A team of researchers from the University of Miami has found a key mechanism linking inflammation in the kidney and lipid-dependent toxicity of podocytes, which are kidney cells that filter waste products from the blood into the urine. An elevated level of tumor necrosis factor (TNF)-alpha within the kidney can lead to chronic kidney disease, according to Alessia Fornoni, MD, PhD. Fornoni was lead author of the study, which was published recently in the Journal of Clinical Investigation. Prior studies in Fornoni’s laboratory have demonstrated that in diabetes, which is the leading cause of chronic kidney disease, there is an accumulation of cholesterol in podocytes. The major findings of the new study show that cholesterol accumulation in podocytes is the result of impaired cholesterol efflux due to locally produced TNF; and that pharmacological or genetic induction of cholesterol efflux is sufficient to protect from experimental diabetic kidney disease. Fornoni’s new data identify a novel pathway linking key clinical and experimental findings that support targeting cholesterol metabolism in patients with kidney disease. According to BCC Research’s new analysis, the overall US market for kidney treatment should reach $39.4 billion and $45.6 billion in 2016 and 2021, respectively, reflecting a five-year compound annual growth rate (CAGR) of 3%. As a segment, treatment of acute kidney injury should grow the fastest, demonstrating a five-year CAGR of 5.1%. Chronic kidney disease treatment, the largest market segment, is predicted to grow to $42.8 billion by 2021 at a five-year CAGR of 2.8%. The population with end-stage kidney disease is just 1% of the US Medicare population, but accounts for 7% of the Medicare budget. Kidney failure is the ninth-leading cause of death in the United States. According to the National Kidney Foundation, Medicare spends, on average, $106,000 for a transplant (including the first year of monitoring) and $24,600 per year for the immunosuppressive drugs, compared to approximately $86,300 for a year of dialysis. Hemodialysis and peritoneal dialysis are the two existing modalities for the renal replacement treatment of the end-stage kidney disease population. Although hemodialysis has dominated the market for decades, peritoneal dialysis has become the largest-growing segment in recent years. The market for dialysis therapies is valued at $15.4 billion in 2016 and is growing at a CAGR of 2.7%. Peritoneal dialysis is estimated to generate $1.8 billion in 2016, totaling 11.4% of the dialysis market. The five-year CAGR of this treatment segment is expected to be 14.2%, bringing it to approximately $3.5 billion by 2021. The segment is dominated by continuous-cycling peritoneal dialysis (CCPD), with 50,100 patients in 2016, of whom 85% are covered by Medicare. Renal Disease Treatments: Products and Therapies analyzes products and services for treatment of kidney failure, including pharmaceuticals, hemodialysis, and peritoneal dialysis products and services, as well as surgical procedures used to keep the patient with end-stage kidney disease alive. Analyses of global market drivers and trends, with data from 2015, estimates for 2016, and projections of CAGRs through 2021, are provided.